St John Guernsey employs people from a variety of background in various roles across the organisation, ranging from front line ambulance staff, administration staff, trainers and shop assistants. Despite the well known image of the accident and emergency service, by far the most ambulance transfers are carried out by the non-emergency service known as Patient Transport Services (PTS). Ambulance Care Assistants are the frontline PTS staff. Their role is to transfer frail and elderly patients and people with varying disabilities, to and from out-patient clinics, day-care centres, routine hospital admissions and other non-urgent healthcare appointments. They often use a specially designed vehicle with tail ramps and winches, but may also use a car. Their job may not have the same high profile as accident and emergency work, but they provide a crucial community service and many elderly and disabled people depend upon it heavily. Ambulance Care Assistants are responsible for patients’ welfare, both on the journey and while being transferred to and from the vehicle. They have to be able to lift, move and drive people in safety and comfort, and also with dignity. They must ensure that their vehicle is clean and in good order, and keep accurate records of their journeys and patients. Because many of their passengers are elderly or in poor health, care assistants also need life-saving skills, should a medical emergency occur. Unlike their colleagues in the emergency service, care assistants see many of their patients on a regular basis and are able to get to know them. Clearly this is not a job for those who dislike responsibility or have no patience with the elderly or needy. Emergency Medical Technicians (EMT) work alongside Paramedics, responding to 999 calls. Research shows that when someone is badly injured or suddenly taken ill, immediate treatment can be vital. The first few minutes can make the difference between life and death, or between complete recovery or permanent disablement. More often than not, EMTs are the first healthcare professionals on the scene of an accident or medical emergency. They assist Paramedics in providing patients with the urgent care they require, whilst at the same time ensuring they get to hospital as quickly and safely as possible. In this respect, they need emergency driving skills as well as their clinical knowledge. EMTs must be able to deal with haemorrhage control, wound care and fracture management, and must be able to handle and care for patients with spinal injuries. They must be able to use defibrillation – electric shock therapy – on a patient with heart failure. They are also trained to give a range of drugs, including pain relief, and various life saving medications used in severe asthma and heart attacks and for treating diabetic patients with blood sugar problems. EMTs, like Paramedics, often work in difficult conditions – in the middle of the night, in bad weather and in confined spaces. They deal with people who can be difficult or aggressive, perhaps because of alcohol, drugs or mental illness and through it all, they must remain reassuring and sympathetic with patients and relatives who may be frightened and distressed. Not all the work involves a life or death emergency. As an EMT, you will also respond to cases where someone may have fallen out of bed and needs assistance off the floor, people who have suffered domestic abuse, and patients requiring transfers to and from the airport for emergency medevac. 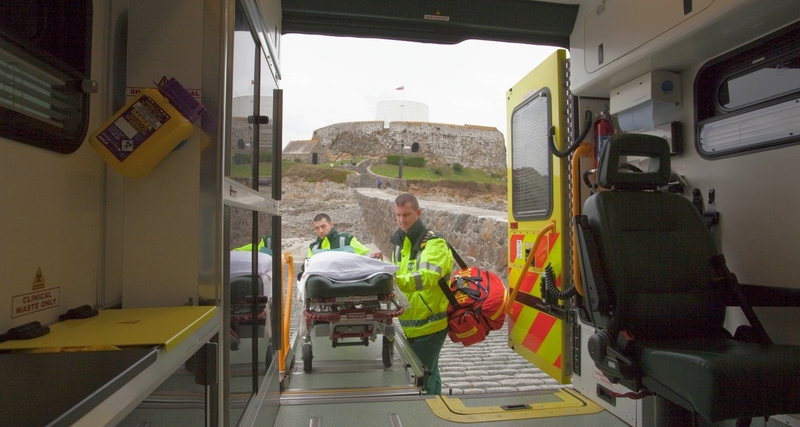 Paramedics in Guernsey work hand in hand with Emergency Medical Technicians and act as a secondary response to immediately life threatening calls. The paramedic is trained in emergency driving, as well as advanced emergency healthcare. Such is the level of knowledge and expertise, that they are now state registered, in the same way as doctors, nurses and physiotherapists. When they arrive at the scene, the paramedic must quickly assess the patient’s condition, make fast decisions about what needs to be done and begin treatment. They work with a range of sophisticated equipment, including heart defibrillators, traction splints and intravenous drips. They administer oxygen and life saving drugs and monitor the patient’s changing condition with devices such as pulse oximeters and cardiac and blood pressure monitors, varying the treatment accordingly. Like Emergency Medical Technicians, Paramedics also often work in difficult conditions, dealing with people in varying circumstances. Throughout, they must maintain a professional image and provide the reassurance that patients often require. There is also the less publicised side of the role: perhaps transferring a sick child from intensive care to the airport for a medevac fight, or going out to an elderly person who has had a fall at home. It may not sound dramatic, but it is still important and highly rewarding. Clearly this is not a career for those who enjoy routine, shy away from responsibility or tend to panic in a crisis.